Far from decrepit , freakish , or bizarre — as new mothers over fifty were recently characterized in a New York Magazine article—Lynn Laszewski is the healthy face of the latest maternal trend. A child of The Quiet Revolution , which has seen women gradually take charge of half of our workforce since the 1970's, she has several degrees in Environmental Science and now works in management as a Resource Conservation Analyst for Pepsico. But it wasn't until she was fifty-one that Laszewski became a mother. And, while her story is unique, it is also a harbinger of motherhood to come. When she was growing up, Laszewski was no stranger to later life motherhood. She had cousins whose grandmother gave birth to the last of eight children at fifty. In middle school, she also had five girlfriends who had grown up siblings and parents well into middle age. Those were the best houses to hang out at, because there were always fresh baked cookies, the best snacks, and plenty of clothes and spending money , says Laszewski. As an adult, she focused on education, and then quickly became engrossed in climbing the corporate ladder, like a significant portion of her ground-breaking generation of women. It wasn't until age forty-one that she met Mr. Right . However, it was a long distance relationship and it wasn't until she was forty-four that they lived under the same roof . Once she realized she had the right guy, Laszewski began to explore the possibility of becoming a mom. Given her age, the doctor suggested donor eggs which raised some real concerns for Laszewski. She wondered how many donor siblings her son might end up with and was uncomfortable that another woman should have to undergo invasive medical procedures on her behalf. For the next two years, the couple tried to conceive naturally, without success. They explored adoption, but found their options limited because they were old . Finally, they went back to the clinic and started the process to conceive via donor eggs. Pregnant at fifty-one, Laszewski was in for a few surprises from the medical establishment. She soon discovered that obstetricians were chary of taking her as a patient due to her age. It took three tries for her to find a doctor brave enough to take on a fifty-one year old pregnant lady . My doctor admitted that her clinic had never taken a mom my age , says Laszewski. After giving birth at the hospital, she found her treatment nothing short of patronizing, as the nurses pushed her to take more pain meds than she wanted or needed. Don't try to be a hero! or older moms often try too hard to be supermoms were some of the statements they made to her. What the heck did I need those for? says Laszewski. I'm thinking 'wow', I’ve had two myomectomies (removal of uterine fibroids) with surgeries lasting more than four hours each time — this c-section is a piece of cake! 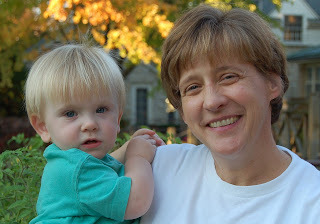 With her son, Kyle, now fifteen months old, Lynn Laszewski has learned much about midlife motherhood. I certainly feel that I can be more dedicated to raising him than I would have been at a younger age , she says. [Back] then, we were busy building our careers, living hectic schedules, and traveling a lot for work. Now we are financially secure and really committed to raising our son. Coming from an athletic background, she also feels more than ready to handle the rough and tumble of a boy toddler. He wants to wrestle and goes at top speed all day! The couple takes part in regular swimming lessons and bike rides with Kyle on the weekends. I don't mind getting in the pool with all the twenty-something moms—I'm slimmer than most due to pure luck of genetics , she adds. These days, having hit the stereotypical glass ceiling in her career journey, Laszewski doesn't mind spending time with her son that she would normally spend trying to break into the next tier of management. It is nice not to have to strive for the next level every waking moment , she says. Being a mommy makes me better at my job—those patience, understanding and open-mindedness skills are always needed in the corporate world , she adds wryly. Ultimately, becoming a mother over fifty has made her an advocate for women and later motherhood in the workforce. Laszewski actively encourages women to stay in the workforce, even after becoming a mom if they're motivated to do so. She admits that — despite all the talk of family-friendly businesses — the real key to succeeding is finding the best manager you can to report to. Direct managers have the power to make decisions, enhance your chances of promotion, grant flexible work schedules and trim your travel schedule . More working mothers means better career conditions for women in the future, according to Laszewski. The more moms in the workplace, the more 'normal' it will be to have moms as CEO's, VP's and managers , she says. I'm glad that my company has a woman and a mom as CEO . I know that other women I work with think that, somehow, it makes a difference for the rest of us . This Pregnancy Over 40 story by Angel Laliberte, founder, AChildAfter40.com: For Women on the Journey of Later Motherhood. Originally posted on October 19, 2011. AUTHOR'S BIO: Angel La Liberte is the founder of ACHILDAFTER40.COM: For Women on the Journey of Later Motherhood, a leading voice for later mothers, featuring real mom stories, expert advice, and online discussion forums about motherhood after 40. She actively advocates for women having children in midlife, and to raise awareness of the real challenges of later motherhood. She has been appeared in over 100 media features across North America, including CNN and PBS TV. Angel gave birth to her children at 41 and 44 after conceiving naturally. Read Her Story, visit her on Facebook, or Twitter. -- Offering men a chance to be heard and women a rare opportunity to view the struggle with infertility from a male perspective, The Brotherhood of Joseph brings to life the anger, frustration, humor, heartbreak, and sense of helplessness that come to dominate the husband’s role. As his remarkable account reaches its finale in Siberia, however, Hansen’s once again becomes the story of a husband and a wife who, even after years of medical frustration and fruitless paperwork, still must take one last risk together and trust in their most basic instincts before their new family can be born. Start reading The Brotherhood of Joseph on your Kindle in under a minute! Get your Kindle here, or download a FREE Kindle Reading App.